“In eight months (they took) over a quantity of goods valued at 7.5 billion Venezuelan bolivars,” Chief Prosecutor Tarek William Saab said. 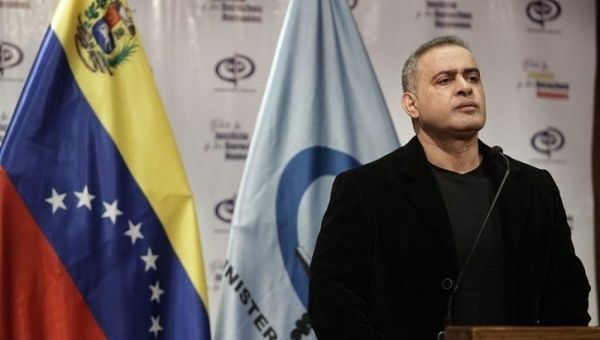 June 7 (teleSUR) The Venezuelan public ministry announced Thursday they dismantled a network dedicated to the theft of medicine and first-necessity goods. Saab highlighted he had requested search and arrest warrants against six of the network’s leaders in the state of Miranda, who have been detained, and announced more warrants against members of this “mafia” are to follow. According to the prosecutor’s investigations, the network was organized to resell medicine and first-necessity goods in the black market at higher prices, contributing to the scarcity that is affecting millions of Venezuelans. “These people have caused great damage to the people who face difficulties to find and get these medicines,” Saab told the press. Between August 2017 and May 2018 1,861 cases of boycott, 535 cases for re-selling goods, and 113 for usury have been launched. A total of 2,149 people have been detained, of which 804 are in prison and 1212 have cautionary measures. For the May 20 elections, President Nicolas Maduro ran on a platform vowing to fight the “economic mafias” he says are largely responsible for the scarcity and inflation that affect Venezuelans.